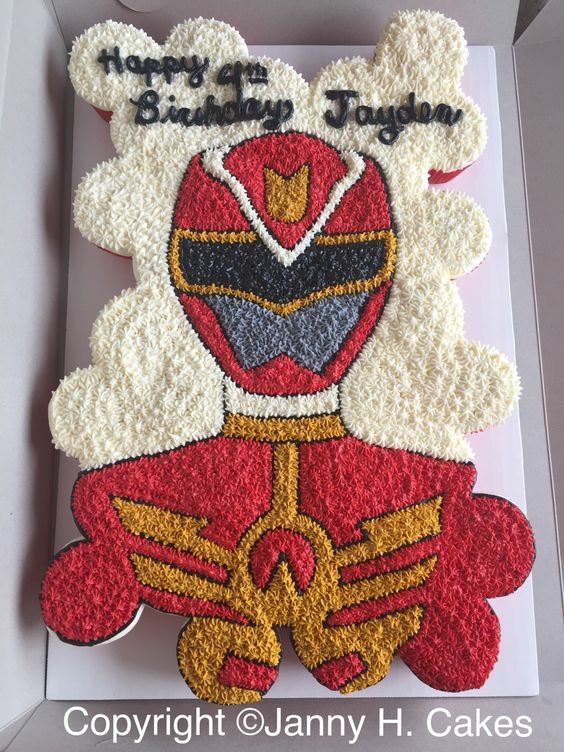 Are you planning a Power Rangers Birthday?! If so, don’t miss these awesome ideas! Has your little one been loving the mighty morphin Power Rangers lately? The favorite alien-fighting superheroes of many ‘90s kids have been enjoying renewed fame lately because of their new film franchise, so tons of kids these days have been shouting “Go, Go Power Rangers!” and pretending to be one of the cool teen superheroes. Lots of kids love the amazing mighty morphin Power Rangers because they get into a lot of action fighting the bad guys. If your kid loves superheroes, then they will surely take pleasure in pretending to be a Power Ranger for their birthday! Want to make your kid happy on their birthday? How about giving them an awesome Power Ranger Birthday Party? Create something extraordinary for your little superhero with these 13 Power Rangers Party Ideas! 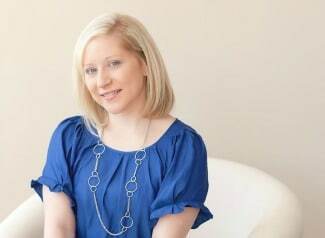 Get inspiration for the birthday cake, invitations, decorations, party favors, desserts, and more! Power Rangers Party Idea #1: No theme party is complete without a cool invitation! Invite your guests with this awesome Power Rangers Party Invitation. It has all the elements of a great superhero invitation with lots of color and of course, the power rangers themselves! Of course, you can create your own cool designs for the invitations. 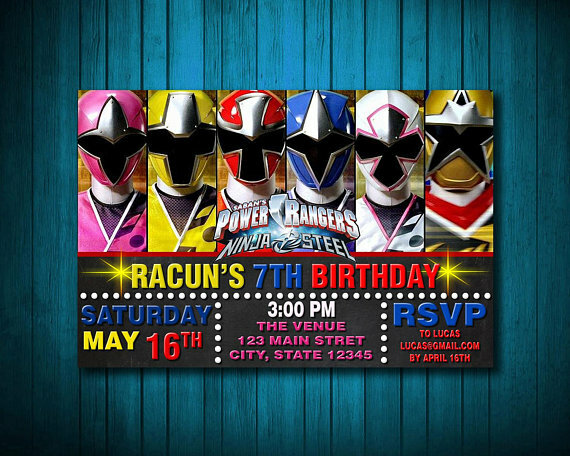 If your little one has a favorite Power Ranger, then you can feature that one on the invites! Power Rangers Party Idea #2: Looking for awesome cake ideas for a Power Ranger themed birthday party? 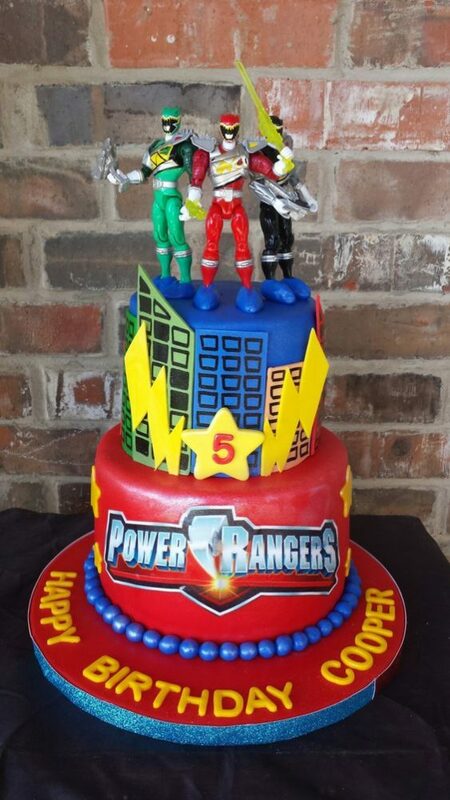 This amazing Power Rangers Birthday Cake will make the kids go wild! Everything about this cake is remarkable. From the super colorful cake tiers to the great action figure Power Ranger cake toppers, this impressive Power Rangers cake is packed with cool elements. If you’ve got the baking and decorating skills to make this cake, you will definitely find it fun and challenging! Power Rangers Party Idea #3: Decorate your party like a pro with Power Rangers Party Decorations like these! 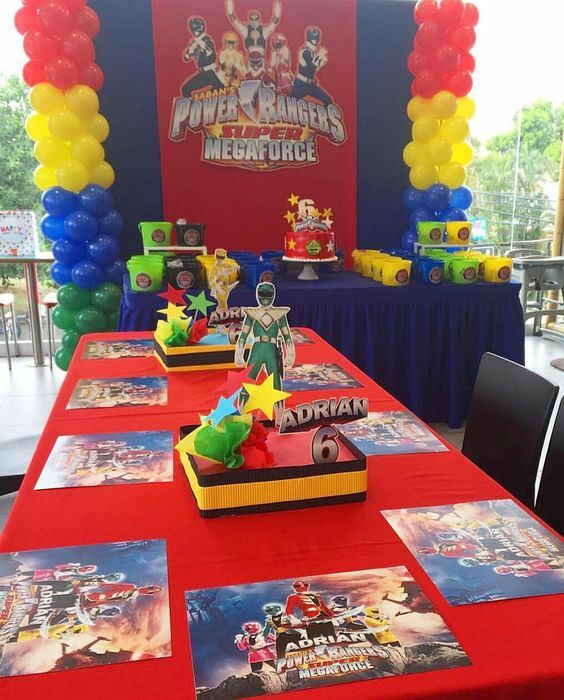 We love the colorful stacked balloons on each side of the cake table and the large power rangers background! AWESOME! Want to go the extra mile? Have customized Power Rangers placemats or even cups. The centerpieces with boy and girl Power Rangers characters are also a great idea. Of course, it wouldn’t be a complete Power Rangers birthday party without an amazing happy birthday banner featuring the mighty morphin superheroes. Power Rangers Party Idea #4: Pinatas are a classic at any kids party, and it’s no wonder why! It generates a ton of fun and excitement at every birthday party, and your little guests will love all the sweet treats and goodies that cracking the pinata brings! 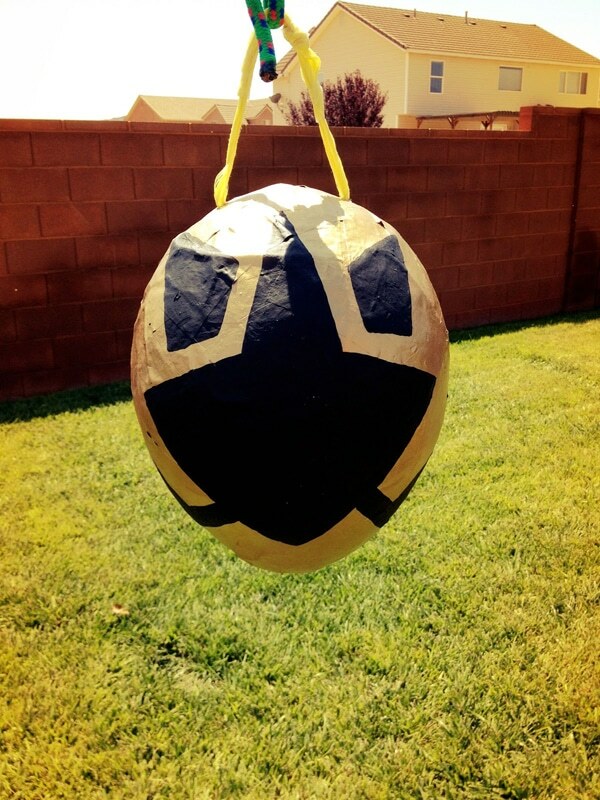 Get crafty and make your own DIY Power Rangers Pinata for kids to have fun with at the party. Fill the pinata with sweet treats like candy bars and cookies and some cool party favors and all the kids at your Power Rangers Birthday Party will surely have a blast! Power Rangers Party Idea #5: Decorate colorful Power Ranger Cupcakes with rings like THESE. These are really great party foods to have on your dessert table. All the little boys and girls will have fun picking out their favorite Power Rangers from the cupcake stand! These custom cupcakes are very easy to make too! You can just use any regular cupcake recipe or even get some regular cupcakes from the store. What will make these cupcakes perfect for your Power Rangers theme are the mighty morphin cupcake rings! You can get them from your local Power Rangers party supplies provider or get them online for less hassle. 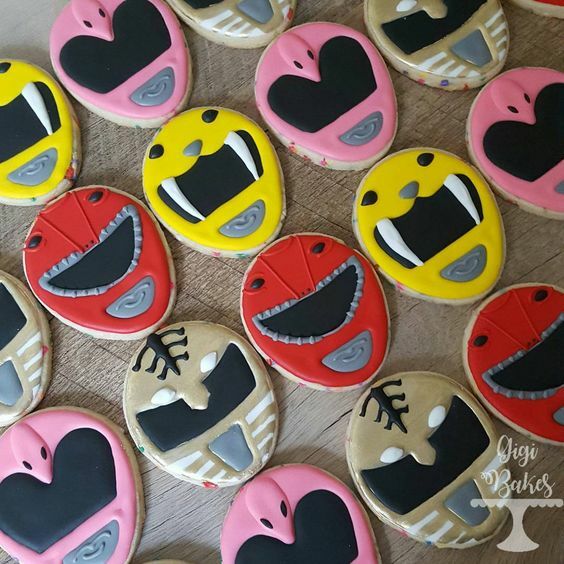 Power Rangers Party Idea #6: Add some Power Ranger Cookies like these to your dessert table. Start with some basic sugar cookies and decorate them with colorful icing to recreate the mighty morphin Power Rangers characters. You will definitely have a wonderful time coming up with fun decorations for these yummy customized sugar cookies for your dessert table! You can even rope your kids or the rest of your family in when decorating these cookies for more added fun! 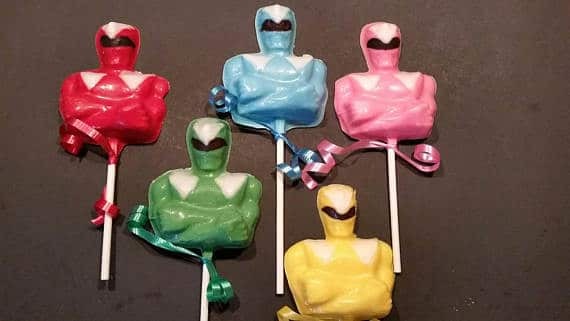 Power Rangers Party Idea #7: How cool are these Power Ranger Lollipop Favors? The kids will love these in their goodie bags! It’s also another amazing idea if you are looking for more sweet treats to add to your dessert table spread or in your pinata at your little one’s Power Rangers Birthday Party. Power Rangers Party Idea #8: These Power Rangers Power Bubble Swords are another great party favor idea! Your little superhero and their friends will have a lot fun playing Power Rangers samurai pretend games and swinging these cool but safe bubble swords around! You can have them in a bucket by the entrance, so everyone can just grab them before they go. These amazing samuraizers are wonderful toys to add to your goodie bags too! 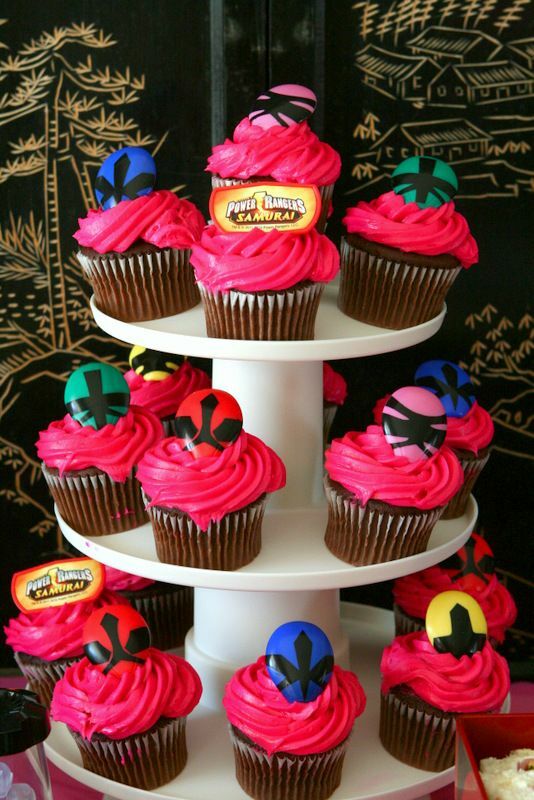 Power Rangers Party Idea #9: Cupcake cakes are all the rage right now. This Power Rangers Cupcake Cake is perfect for the occasion! The great thing about cupcake cakes is that you can have loads of different flavors of cupcakes to satisfy all your guests. Plus, they are super easy to grab from the dessert table too! No more cake cutting required! 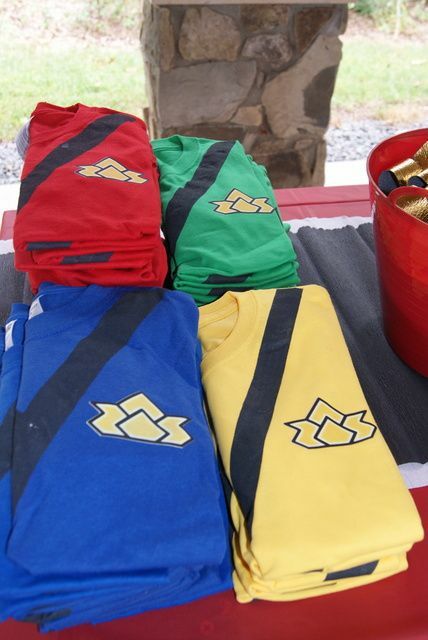 Power Rangers Party Idea #10: These DIY Power Rangers Party Shirts are fantastic! The kids will LOVE wearing them! All you need are some ready-made patterns or some tape to create the patterns, acrylic or fabric paint, and your creativity! You can even make DIY gold belts and samuraizers to complete the outfits for your little guests to wear at your fun Power Rangers Birthday Party! If you don’t have the time to create these DIY shirts, you can also request custom shirts from a local T-shirt printer. Just give them the design you want, and you’re good to go. 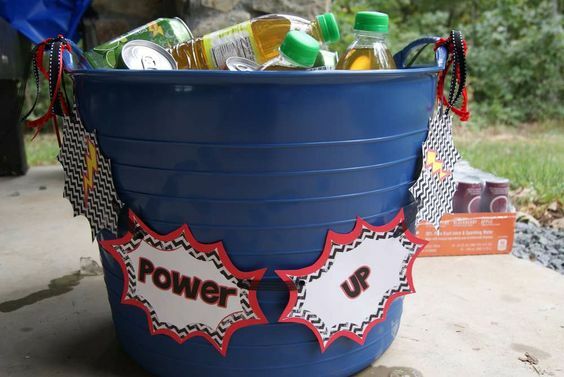 Power Rangers Party Idea #11: Let the superheroes “Power Up” at the drink station! No complicated DIY steps to be done here – all you need is a bucket, some custom paper cut out decorations, and the drinks. What a great idea for a Power Rangers Party! 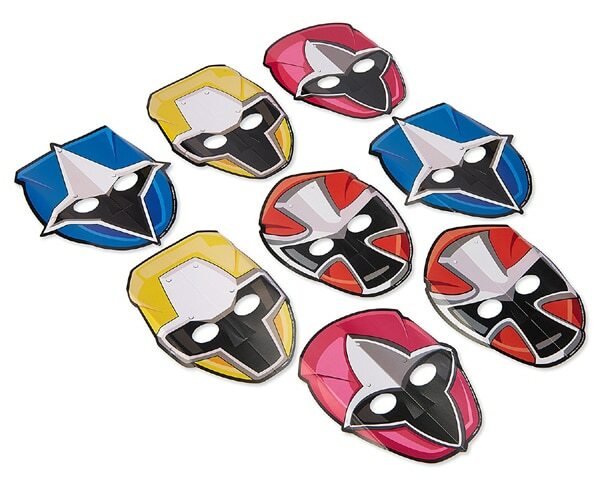 Power Rangers Party Idea #12: The superheroes in attendance will feel powerful with these fun Power Ranger Party Masks! No Power Ranger costume will be complete without one of these cool masks. There’s one for every ranger, so all the little boy and girl Power Rangers at your children’s birthday party will definitely find one they like! Power Rangers Party Idea #13: Looking for something fun for the kids to do during the party? 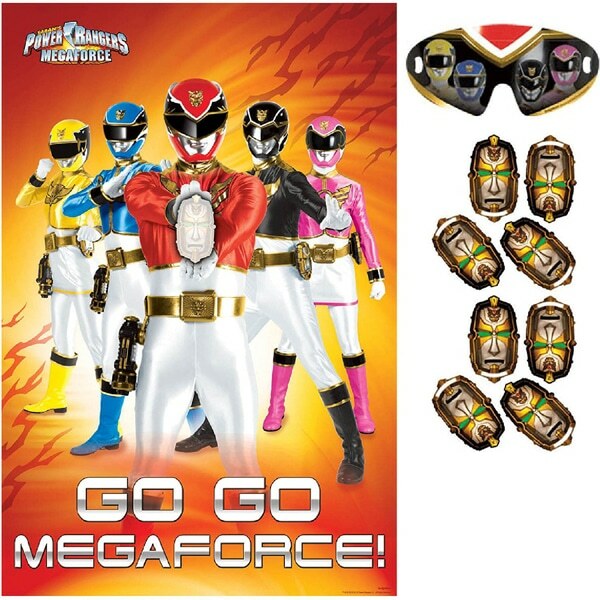 This Power Rangers Megaforce Party Game is just the answer! If you need super enjoyable Power Ranger games for kids, this Megaforce party game is an excellent choice. Your kid’s party guests will definitely have fun trying to place the stickers in the correct spots! You can even do the whole spin them around routine for more laughs! With these fun and creative Power Rangers birthday party ideas, you will definitely have a ton of fun planning and having your little superhero’s themed party. Give one or all of them a go for an enjoyable party that everyone will remember! Which of these 13 Power Rangers Party Ideas are your favorites? Let us know in the comments below!